The second way, if the Kowung River is swollen you can come up from the Wobeyan Caves Road, left into Jerrong Road and then you\'re on your way. Either way, there is steep climb/descents which will require low range mode, there are also a number (3 or so) creek crossings. 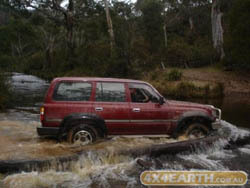 You will drive along Lime Burners tracks which is predominately loose rock surface. the tracks leading through dingo dell pass through private property. as such, there are areas around dingo dell that are fenced. these areas have been had erosion scars repaired by members of 4wd clubs as part of a project by 4wd NSW and ACT. the owner of the property has set aside a camping area for use of the clubs of 4wd NSW & act on a booked basis. we ask that users of these tracks respect the fences and gates and do not cross them without the permission of the owner. this would include not passing through damaged fences and gates. the Banshee fire trail is not a through rd, it is accessible from the top (Banshee rd) down to the NPWS gate at the lookout to Morong Falls, and no further. the owner has kept through access on the Kowmung fire trail for the public\'s use. Limeburners is all locked up these days. Very solid nat parks gates. Heading thru here to Yerranderie makes a great drive, pretty easy drive in dry weather, lots of clay on the hills to make it a challenge in the wet.